Parma week has over-run a little bit but that’s okay. I don’t exactly have a wealth of time to devote to writing at the weekend so this is bound to happen from time-to-time. I’ll be introducing this week’s feature club later today and I hope to start sinking my teeth into them tomorrow, but I wanted to complete the Gialloblu Giants series first. I would have loved to add another 3-4 pieces to this series but I don’t want to get too bogged-down with Parma. A Buffon profile was on the cards as was a look at some Parma’s ’90’s managers and strikers, but I’m going to have to condense everything into one itty-bitty piece. These players definitely deserve a mention, and it would be criminal to close “Gialloblu Giants” without giving them their due. An outrageously talented striker, Zola joined Parma after spells with Nuorese, Torres and Napoli and really started to grow into the outstanding player he’d eventually become while at the Tardini. His ability should need no introduction: Zola was one of the best deep-lying forwards of his generation and a wizard with the ball at his feet. Scoring 49 Serie A goals in 102 Gialloblu appearances, Zola was never more prolific than during his time with Parma. I’ll always remember him as (arguably) the best foreign player to ever play in the Premier League, but his dazzling sill first caught my eye at Parma. Melli’s two spells at the Tardini brought him 56 goals from 241 Serie A appearances. He wasn’t exactly a goal machine, but he was an incredibly loyal servant and a vital contributor to Parma’s success in the ’90’s. I’ll always remember his partnership with Tomas Brolin, even though it was rather short-lived. Not the most outstanding individual player but a useful squad member who’d go on to serve as Parma’s General Manager. One of two players on this list who is still actively playing, Crespo is actually still a Parma player. He left the club in 2000 to enjoy gold-filled spells with Lazio, Inter, Chelsea, Milan, Inter again and Genoa before returning to the Tardini in 2000. Crespo was a very capable advanced striker in his day and a very prolific goalscorer. Usually averaging about a goal every other game wherever he goes, Crespo will still be scoring when he’s 50. A return of 10 in 42 since his Gialloblu return shows there’s still life in this old dog yet. Tino was around for both of Parma’s UEFA Cup victories even if his second spell was nowhere near as productive at first. As a Newcastle fan I am naturally biased towards Tino. He was a big favourite of mine, and I was delighted when my team signed him from Parma in 1996. On his day he was unplayable. Genuinely one of the most talented players I’ve ever seen, Asprilla unfortunately lacked the mental strength to match his sublime technical and physical talents. He was equally capable of brilliance and madness, and would often show both in the same game. Honours: UEFA Cup, Coppa Italia, Supercoppa Italiana. Buffon, like Crespo, is still an active player. I don’t think I need to explain just how good Gigi is. He’s clearly one of (if not the) best goalkeeper in the world, even if his recent form has been a tad suspect, and he’s fully justified his tag as the world’s most expensive goalkeeper. Buffon has been a stalwart for Juventus and the Azzurri for years, but a lot of people forget he actually made over 220 appearances for Parma back in the day. The world sat up and took notice of Buffon’s talents during his time at the Tardini, and his reputation really went skyward after an incredible three-trophy haul in the 1998-99 season. I realise I’ve used the word “favourite” to describe quite a few players this week, but I can’t think of a ‘keeper I admire more than Gigi. Honours: UEFA Cup, UEFA Super Cup. Bucci was the man Buffon displaced as Parma’s #1 in the mid-’90’s and was a good goalkeeper in his own right. Like Melli, Bucci’s mention has more to do with loyalty than exceptional ability, but he was a solid ‘keeper who always did well when called upon. Incredibly, Bucci had four separate spells at the Tardini and ended his lengthy career in 2009 (aged 40). Bucci made a total of 181 Serie A appearances with Parma, and was considered the club’s #1 again after his return in 2005. Honours: Copa Italia, UEFA Cup Winners’ Cup, UEFA Cup, UEFA Super Cup. A very talented manager who is sadly no longer in the game, Scala (along with Parmalet, of course) built the foundations for Parma’s success and moulded the club into a juggernaut in the ’90’s. Scala took Parma from Serie B to European tournament winners in just four season, and was responsible for bringing through some of the greatest players in Gialloblu history. His 5-3-2 system was a Parma mainstay for years, and he deserves to go down in history as one of calcio’s all-time greatest managers. Honours: Coppa Italia, Supercoppa Italiana, UEFA Cup. Current Genoa coach Malesani didn’t quite leave behind a legacy as big as Scala’s at the Tardini bt he did guide the Gialloblu to their most successful season of all-time in 1998-99. Winning three trophies in one season made him an instant favourite, but Malesani would eventually be replaced by the legendary Arrigo Sacchi in January 2001 after a poor start to the 2000-01 season. Things started to decline badly for Parma after Malesani’s departure and Parmalet’s demise, but he deserve his place in history. There are plenty of great Gialloblu midfielders I could’ve dedicated an individual profile. Juan Sebastian Veron only spent a single season with Parma but he was an excellent playmaker and I’d love to analysis and break his playing style down. Massimo Crippa, the tough-tackling achorman, was one of my favourite Italian players growing-up, and what about Dino Baggio? Stefano Fiore? Diego Fuser? As good as these players were, none captured my imagination quite like Tomas Brolin. The Swede played for Parma from 1990-95 and again in 1997, so I didn’t see him play as much as Baggio or Crippa, but I was often dazzled by what I saw of him. Brolin was a great player in his pomp, and his story is both sad and fascinating. Spending his career’s formative years in his native Sweden, Brolin shot to international prominence a series of impressive performances at Italia ’90. Brolin’s club, IFK Norrkoping, were soon inundated with phone calls from potential suitors. In the end newly promoted Parma won the bidding war, and Tomas signed for the Gialloblu in a £1.2m deal later that summer. Brolin started his Parma career as a deep-lying forward and quickly forged a productive striker partnership with Alessandro Melli, a more advanced striker. The two scored 20 goals between them in Parma’s first-ever season of top-flight football, helping propel the Gialloblu to a 5th-place finish and European qualification. 1991-92 was even more fruitful: Parma finished 6th in Serie A and beat Juventus 2-1 on aggregate to win the Coppa Italia (the first major trophy in the club’s history). As successful as these two seasons were, the next two were the making of Brolin. Faustino Asprilla, the sporadically brilliant Columbian (and cult hero of mine, as a Newcastle supporter), joined Parma in the summer of 1992 and many expected him to take Brolin’s place in the starting XI. Brolin was benched in favour of Asprilla for most of 1992-93, but an injury ruled the Columbian out of the Cup Winners Cup final. Brolin grabbed his opportunity with both hands and performed well, helping Parma to a 3-1 win over Royal Antwerp. Future legend Gianfranco Zola signed for Parma the following summer and it widely assumed that the Swede’s days were numbered. Nevio Scala, however, had an ace up his sleeve. The coach, having seen the benefits of playing Brolin in midfield in 92-93, pulled Brolin even deeper and positioned him centrally in a 3-man midfield with Crippa and Gabriele Pin. Brolin thrived in his new role and was handed his former strike partner Melli’s number 7 shirt. Still only 23, Brolin reinvented himself as a playmaker. His technique, quality on the ball and passing ability made him a great candidate for the role, and his performances as a pseudo-regista helped Parma to another Cup Winners Cup final in 1994 (sadly, they lost 1-0 to Arsenal). Tomas was in the best shape of his life by the time the 1994 World Cup came around. Playing as a striker (as he always did for his country), Brolin was one of the stars of the tournament. His grinta was vital to an unfancied Sweden side as they battled their way to a fantastic 3rd-place finish after victories over Russia, Saudi Arabia, Romania and Bulgaria, and a group stage draw with eventual champions Brazil. Brolin scored 3 goals at USA ’94 and was the only Swede to be named in the All-Star team. Tomas had the world at his feet, and there were rumours of him moving to Barcelona as Hristo Stoichkov’s replacement. Despite the Catalans’ interest, Brolin opted to stick with Parma with the belief that they could mount a serious title charge in 94-95. Sadly, this is where things start to fall apart. On November 16th 1994, Tomas Brolin broke his foot during a Euro ’96 qualifier in Stockholm. Parma were 2 points clear at the top of Serie A when Brolin sustained the injury and they suffered badly in his absence. The Swede eventually returned in April 1995 with his team 8 points adrift of league leaders Juventus. He made his return start for Parma on the 7th May in the absence of Gianfranco Zola and struggled for form and fitness for the rest of the season, failing to complete 90 minutes once. To compound his misery, Brolin was sent-off against Napoli on the last day of the season and Juventus took the Scudetto. The Swede faced a long, arduous summer. Tasked with recovering his fitness and keeping new signing Stoichkov out of the team, Brolin scored two pre-season goals but Scala saw little improvement in his fitness level. Brolin was dropped for Massimo Bambrilla and never reclaimed his place. Struggling for form, fitness and confidence, Tomas Brolin had fallen out of the loop at Parma. It was time to move on. Leeds United swooped to sign Brolin on a two and a half year deal and the Swede made his debut a day later at Newcastle. After battling his way into the Leeds XI, Brolin turned in a vintage performance against Manchester United on December 24th, 1995. Even Eric Cantona looked second-class as Tomas tormented the Reds’ defence all evening: Leeds won 3-1 with Brolin having a hand in every goal. Things seemed to be looking up for Brolin and a good start at Leeds had yielded 4 goals from 8 Premier League games. Things turned sour in January 1996: Leeds were thrashed 5-0 by Liverpool and manager Howard Wilkinson chose to point the finger at Brolin, labelling the forward “lazy” and criticising his defensive contribution. Things never really improved between Wilkinson and Brolin. Tomas was eventually loaned to FC Zurich after failing to report for pre-season training, but returned to Leeds shortly after Wilkinson was replaced with George Graham. Brolin, however, refused to go back to Elland Road, and only accepted his recall when threatened with legal action by his parent club. Injuries continued to plague Brolin. A metal staple inserted into his ankle during an scar tissue-removal operation earlier in 1996 scuppered a move to Sampdoria. Oblivious to the staple’s existence, Leeds called Brolin back to Yorkshire to have the injury properly examined amidst fears that his playing career might have reached a premature end. Brolin never played to Leeds again, and was eventually loaned back to Parma in December. His return to the Stadio Tardini was fruitless, with Brolin restricted mostly to brief cameos and substitute appearances. The Gialloblu decided not to renew the Swede’s deal and he returned to Leeds, only to have his contract terminated in October 1997 for skipping a match without prior permission. Brolin at Palace: a shadow of his former self. A free agent for the first time in his career, Brolin wasn’t exactly hot property but managed to secure a deal with Crystal Palace. His spell with the Eagles was every bit as shambolic as his time at Leeds. Brolin failed to score in 13 Palace appearances. By this point he was visibly overweight, completely out of form and a sad shadow of his former sense. He retired in August 1998 aged just 29. It’s a huge shame that Brolin’s career panned out the way it did. He was once a wonderful player with all the potential in the world, but he never truly recovered from that first injury. Excellent in his first Parma spell and brilliant for the Swedish national side, Brolin was, in 2003, voted Leeds United’s “worst ever signing” in a BBC poll. Few players have fallen quite as far as Brolin, but his conduct at Leeds and Palace didn’t exactly do him any favours. 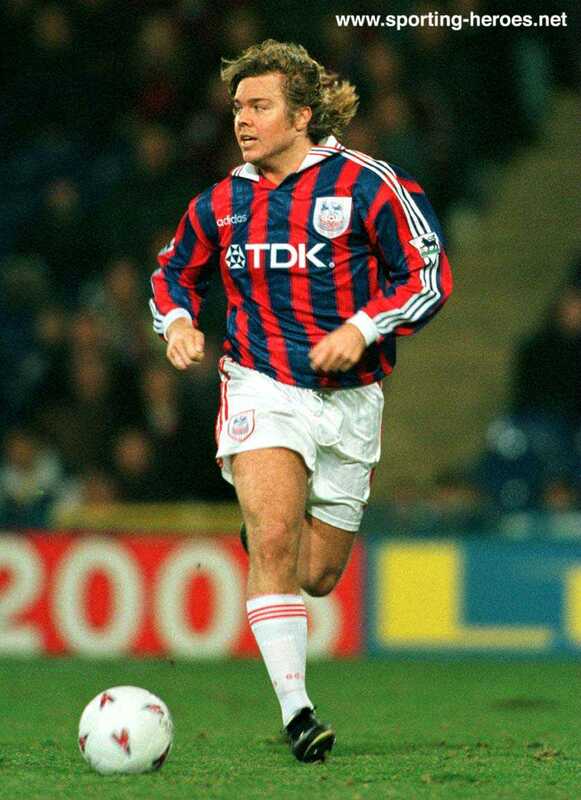 Most British football fans remember Tomas Brolin as an overweight flop, but not me. His time in Britain was an unmitigated disaster, but Brolin’s brief boom at Parma was absolutely thrilling. A midfield maestro for Parma and a deadly marksman for his country, I choose to remember Tomas Brolin, the wonderkid, not Tomas Brolin, podgy waster. It’s difficult for me to write an article about Fabio Cannavaro without filling the opening paragraph with superlatives. This is one of the all-time greats we’re talking about here: a great captain for club and country, my favourite defender and, more importantly, a Parma legend. Joining from Napoli in 1995, Cannavaro made 289 appearances in 7 seasons with the Gialloblu, scoring 6 goals in the process. Cannavaro built his reputation as one of the world’s best central defenders during his time with Parma and the steps taken at the Stadio Tardini helped him accrue an enviable list of honours. Cannavaro slotted straight into Parma’s XI and was immediately at home in Nevio Scala’s 5-3-2 formation. Leaving his hometown club Napoli was a huge wrench for Fabio, but the move paid-off big-time. The Gialloblu were already renowned for their sturdy defence and Cannavaro’s arrival further solidified their backline. This coupled with Scala’s sound defensive philosophies created the perfect environment for Fabio to grow into one of the all-time great centre-halves. 1995-96 wasn’t a great season for Parma. Cannavaro made 36 appearances in all competitions as the Gialloblu laboured to a 6th-place finish after finishing 3rd the season before. Things improved in 96-97 for both Parma and Cannavaro. Disappointing runs in the UEFA Cup and Coppa Italia saw Parma exit in the 3rd and 2nd rounds of those competitions, but they managed a 2nd-place Serie A position after drawing with Juventus on the closing day. More significantly, January 1997 marked the start of a long and hugely successful international career. Cannavaro made his Azzurri bow in a friendly with Northern Ireland, and would go on to earn another 11 caps before the year’s end. A particularly notable performance came in a World Cup ’98 qualifier against England at Wembley. Cannavaro dominated Alan Shearer, then considered one of the best strikers in the world, for 90 minutes as Italy eeked-out a 1-0 win. The next season was mostly fruitless for Parma as new coach Carlo Ancelotti could only guide them to another 6th-place finished. 98-99, however, was huge. The Gialloblu finished 4th in Serie A but won both the Coppa Italia and the UEFA Cup, beating Marseille 3-0 in the final. Parma’s record was hugely impressive in 98-99, but I’m going to hold the details for now as I plan on taking a look at their UEFA Cup winning sides later this week. Doping allegations would sadly may Cannavaro’s 98-99 triumphs when Shady footage of the Parma captain receiving injections before the UEFA Cup final surfaced on the internet a few years later. The substance was later found to be Neoton (Phosphocreatine), a chemical commonly used to produce muscular energy. Neoton was not on the banned substance list and no action was taken, but the taint remains. Personally I see nothing wrong with an athlete using perfectly legal substances to enhance their performance before a big game, but c’est la vie. Parma struggled to mount a serious title challenge after the highs of 98-99 and finished 5th the following season. They captured the Supercoppa in 99-00 and finished 4th in 2000-01 (reaching the Coppa Italia final along the way), before winning the Coppa Italia the following seasons despite a dismal finish of 10th in Serie A. 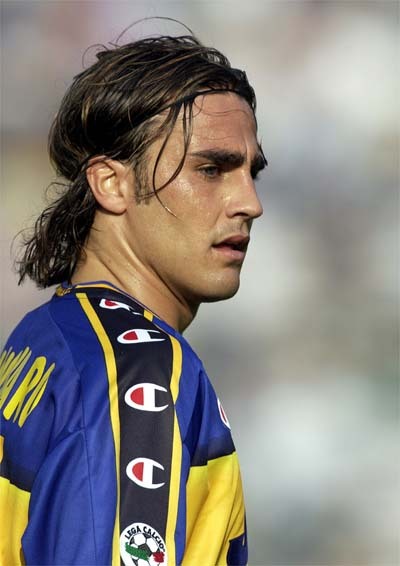 Sadly 2001-02 would be Cannavaro’s last at the Stadio Tardini as Fabio, now recognised as one of the world’s best defenders, left for Inter in a €23-million deal. Fabio pulled the curtain down on an illustrious career this summer after spells with Juventus (twice), Real Madrid and Al-Ahli Dubai. His international career continued until 2010, with his crowning glory being Italy’s 2006 World Cup win. Cannavaro put in a series of legacy-defining performances for the triumphant Azzurri, earning himself the nickname of “Wall of Berlin” after a particularly impressive showing in the final (held in Berlin’s Olympic Stadium, hence the nickname). Not only did the 2006 World Cup secure Cannavaro’s place in Azzurri history but his world-class performances helped him capture the 2006 FIFA World Player of the Year and Ballon d’Or (European Footballer of the Year) awards. Impressively, Cannavaro was the first defender to win the latter since Lothar Matthaus in 1990, while he and the German sweeper remain the only to defensive players to ever be named World Player of the Year. Writing a laundry list of Fabio Cannavaro’s accomplishments is all very well but it only tells half the story. 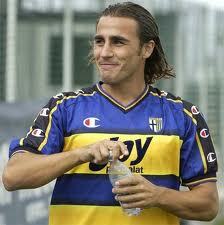 I’ve spent plenty of time going over Fabio Cannavaro’s legacy, but what about Fabio Cannavaro the player? Everybody he was a great defender, but what made him one of the most celebrated centre-backs in history? Some believe that crunching tackles, determination and desperate lunges are the prerequisite components of a great defender. I disagree completely. Of course defenders need to be determined and strong in the tackle, but there’s more to defending than that. I believe that composure, intelligence and elegance are just as important in defence as in attack, and Cannavaro was the perfect personification of all three. I’ve never seen another defender who can read the game like Cannavaro. Just as Barcelona’s tiki-taka wizards can see passes that are just invisible to other players, Cannavaro could telegraph attacking moves before they’d even happened. He was a master of nipping attacks in the bud by cutting them off at the supply with blocks, interceptions and straightforward tackles. Cannavaro’s career isn’t littered with frantic, last-gap challenges because he simply didn’t need to make them. His vision was so good that he was able to kill attacks before they became serious threats by exercising one of the sharpest defensive minds in the game. Cannavaro was strong, but he didn’t use his brawn to carry him through games: he, like most other great defenders of the modern era, used his brain. Watching Fabio Cannavaro in his prime was always a pleasure, especially at the 2006 World Cup. Rarely eye-catching but always effective, Cannavaro was always in the right place and not by chance. He turned defending, football’s most destructive element, into a genuine thing of beauty, and for that he should be commended. That is why I’ve always loved Cannavaro. Studying his style completely changed my perception of how a defender should play, and his success shows that you don’t have to be the biggest (Fabio was only 5’9”) or the toughest to be a top centre-back. I salute you, Il Capitano, and hope we soon see your like again. … and hey, how many other defenders have had such a “charming” song written about them? Il Capitano: can anybody name me a better centre-back? It would be wrong to call myself a Parma supporter: they, like Napoli and Hellas Verona, are just one of a number of Italian teams I’m particularly fond of. I don’t actively follow them and I don’t pretend to have any real loyalty to them, but I usually cheer when I see them doing well. I was genuinely gutted when they almost went out of business a few years ago. Parma were a huge part of my football education, so it’s good to see them back in Serie A under Thomas Ghirardi’s ownership. Parma’s name always pops into my head when I think of “big” Italian clubs, even though they’re small fries compared to the likes of Inter and Juve. They were just so good in the nineties, and I haven’t really been able to shake that from my head despite their recent misfortunes (and stint in Serie B). It’s testament to the greatness of those old sides that I will always consider Parma one of the greatest Italian clubs. They’ve never Serie A but boy did they come close. Parma were runners-up in 1996-97 and rarely finished outside the top six. In addition they’ve won the Coppa Italia thrice (91-92, 98-99, 01-02), the Supercoppa once (1999) the UEFA Cup twice (94-95, 98-99), the Cup Winners Cup (RIP) (92-93) and the European Super Cup (1993). An impressive record, and one that I hope they can add to in the future. This week is going to be pretty self-indulgent. I’m going to spend a lot of time revisiting the good old days and profiling some of the prominent figures from this time period. I don’t want to completely neglect the Parma of today, but there are so many good memories to look back on. Starting tomorrow I’ll be taking a closer look at some of my favourite Parma players, teams and managers. I’ve no idea how many I’ll get through but there are literally dozens of things I want to write about this week. Lets see how I do.